I am having the hardest time waiting for Friday..... Why you might ask..... I am going to a friends house for a weekend "crop". We are going to spend Friday,Saturday and Sunday creating our buts off!!! So YAY us!! 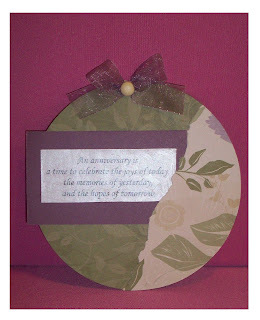 I took a cd and covered it with CTMH paper (paper that I didn't even know I had) I found this cute little Anniversary saying and printed on regular pc paper and used my glitter painters to give it some sparkle. On the back of the cd is the purple paper to make a opening for a card. The brad and ribbon are also CTMH. I am loving this many more will be made like this!! That is so cute!! I love the paper you used! Very creative and unique. Wonderful design! Beautiful card- very soft and elegant, and what a creative design! Very, very pretty...I really like your blog. very pretty! great use of those cds you get in the mail :) have a wonderful weekend ... i am very jealous. i am cropping on friday with friends but its only one night ... i shouldn't complain but a whole weekend sounds heavenly! and enjoy your crop weekend. sounds like a blast! I'll be doing some of the same next week on the cruise with Gina k, stampinbella and nicole. I'm so excited! What a beautiful card. I love your creativity! A whole weekend to crop, that is so cool! Oh how cute!! What a great idea to use old cds. I LOVE this!!! I have done things with CD's before, but never a card! Could you post a little more about how you did the back??? Oh, and have a great time at your creative weekend. I am so jealous! I hope you enjoy every minute of it! What a great blog! and this card is gorgeous! I love the layout! TFS! and have a great time at your crop! 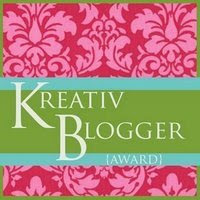 Samantha just added me into her SCS blogger group -and I was so pysched when I saw your name! YAY! I love your creations - they are beautiful and totally inspirational - can't wait to try that with the CD!! Can't wait to see what you create this weekend at your crop! Have sooo much fun! This is so awesome, what a fab idea!!!! Great card - I have to do a recycle challenge and this would be perfect - thanks for the idea. This card is so pretty! What a great idea for all those scratched up CD's and DVD's the kids never put away!! What type of envelope did you use? I think I'll turn this into a class for my regular stampin' ladies! B2 B3 No spike - 0 uM 0.01 1.63 2.81 3.14 Mean recovery Standard deviation Standard error 210 Appendix B Validation of the Glutathione Peroxidase assay kit Spike and recovery experiments are used to determine whether the sample matrix Tationil Glutathione Injections Italy with vitamin c - 2500. Good cocoa bean chocolate is a highly complex food that is really very good for you. What happens when these autistic students make it into the world of professional music? That question is easy to answer because I have experienced it first hand. Add avocados to your next salad and your body will absorb five times the carotenoids than without them. I am a SAHM mother of 3 (somtimes)wonderful kids. 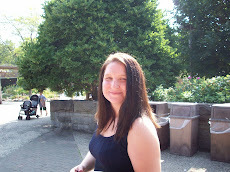 Married to my Jr.High sweetheart for 7 years now.I love to read and shop!! My main hobbies right now are cardmaking, stamping, and a little scrapbooking thrown in. Always looking for people in the Cleveland Ohio area to "crop" with. I am really in to Stampin Up! right now(spending way to much money with them). Win a Pound of Paper! By The Cute And Girly Spring Time! Whismy, Purple and CD Card Instructions! Weekend! & Blog Candy help! Sisterhood of the Traveling Cards! !